including: Table of Contents, overviews and selected pages. Limited desk copies available for educators in paper format. Please email cct@criticalthinking.org to inquire. This thinker's guide is focused on making intellectual work and deep learning more manageable, practical, and intuitive. Its goal is to foster lifelong learning and the traditional idea of a liberally educated mind: a mind that questions, probes, and masters a variety of forms of knowledge, through the command of itself, intellectual perseverance, and the tools of learning. In this guide, we suggest a variety of strategies for becoming not just a better student but a master student. For orders of 500 or more copies, please email us at cct@criticalthinking.org for special pricing. Why A Thinker's Guide On How To Study & Learn? 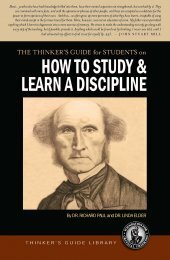 This thinker's guide is designed not only for students but also for administrators and faculty, to remind us all of the essence of what it is to study academic subjects with discipline. It does not aim to take the intellectual work out of learning---for this would be an insult to the intelligence of our readers. It contributes, rather, toward making intellectual work and deep learning more manageable, practical, and intuitive. Its goal is to foster lifelong learning and the traditional idea of a liberally educated mind: a mind that questions, probes, and masters a variety of forms of knowledge, through the command of itself, intellectual perseverance, and the tools of learning. It respects equally the traditions of John Henry Newman, Bertrand Russell, and Albert Einstein. It does not answer all questions, but rather puts all questions into a clear perspective. It emphasizes that all bona fide fields of study share common intellectual structures and standards of reasonability. It emphasizes that foundational intellectual structures and standards of reasonability are worth learning explicitly and in themselves since they help us more deeply interconnect and understand all that we learn. It also emphasizes foundational intellectual dispositions and values that define the traits of the disciplined thinker in all fields: intellectual autonomy, intellectual humility, intellectual integrity, intellectual perseverance, intellectual empathy, confidence in reason, and fair-mindedness. On every page, it honors the idea and power of intellectual work. It scorns the idea of knowledge as the memorizing of bits and pieces of information, or as the mere accumulation of so many units or institutional credits. It rejects both dogmatic absolutism and intellectual relativism. It warns us of the danger of ignorance and misconception, and by implication, that of self-deception and illusion in human affairs. It emphasizes the importance of contrasting disciplines whose questions are, by and large, answerable in definitive ways, with those whose questions require multiple perspectives, role-playing, and reasoned judgment. It distinguishes, in short, one-system subjects like physics, chemistry, and math (where disagreement between experts plays a minor role) from competing-systems subjects like history, psychology, and art (where expert disagreement plays a major role). If this thinker's guide is successful, it will serve as a resource to which one can return again and again to garner new depth of meaning and understanding. What is worth learning is worth learning well, and there is nothing better worth learning than the very process of learning itself: the development---through systematic intellectual work---of the arts, habits, and strategies of a DISCIPLINED mind. I am incorporating the How to Study & Learn miniature guide into the course as well during spring term. Thank you for the exam copy. I plan to use it along with the text and the "little blue book" Critical Thinking Concepts & Tools. One valuable part in the "little yellow book" is the essential idea at the bottom of each page. One technique I tried this last quarter in class was to have students write down one key concept or idea they felt they had learned that day in class. It was an effective way for me to gauge their understanding of what had been discussed in class. When I did this during the last five minutes of class, it was also an effective review because I called on several students to read aloud the key idea or concept. Another valuable characteristic of How to Study & Learn is that it speaks to the student as if s/he is a real human being. Students appreciate that they are engaged in the process. I am also going to use this miniature guide as a source of reading material when I teach students to critically read. The passages are short and will work well for this exercise. As I use this new guide, I will let you know how students respond to it...kudos for your work. Criticalthinking.org Copyright ©2019 Foundation for Critical Thinking.